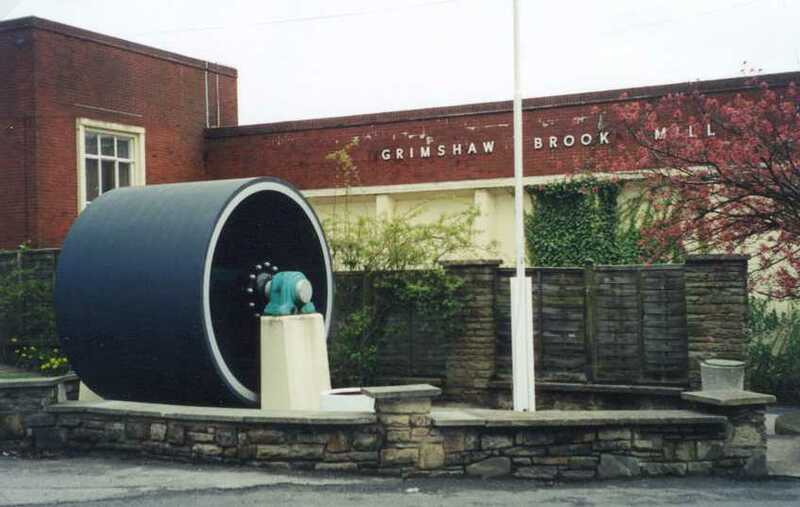 The Grimshaw location is about 3 miles southeast of central Blackburn, in the Township of Eccleshill. It is actually in two parts  Lower and Higher Grimshaw. The location is shown on the current Ordnance Survey map on another webpage. A view of the “back side” of the Grimshaw location, as photographed from Belthorn at the top of the hill on Yate and Pickup Bank, is shown in Figure 1. An envelope factory (Grimshaw Brook Mill) and closed-down paper mill are located at Lower Grimshaw, and a farm is located at Higher Grimshaw. The Grimshaw site is on a stream called Hoddleston and then Waterside Brook in its upper reaches, Grimshaw Brook in the middle portion (where the Grimshaw site is), and Davyfield Brook in the lower reaches. This stream also forms the boundary between Eccleshill Township to the west and Yate and Pickup Bank Township to the east. The Grimshaw site is located on the west side of the stream just inside Eccleshill Township. Figure 1. 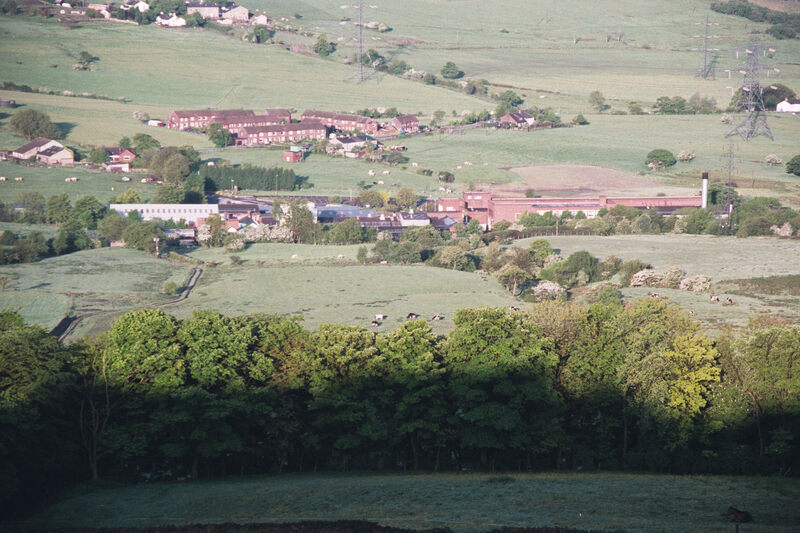 The Grimshaw location in Eccleshill, taken southwestward from Belthorn atop Yate and Pickup Bank. The brick building extending to the left from the smokestack (right side of photo) is an envelope factory. The buildings to the left of the brick building are warehouses and a closed-down paper mill. Higher Grimshaw Farm (back view) can be seen near the left side of the photo, above the paper mill. Photo taken May 2000. The Grimshaw location was greatly affected by development during the Industrial Revolution. The paper mill and envelope factory at the Grimshaw location (Figure 2, 3) are described in more detail on a companion webpage that covers the industrial history of the site. The original facility was a cotton mill called “Grimshaw Bridge Factory”. Figure 2. 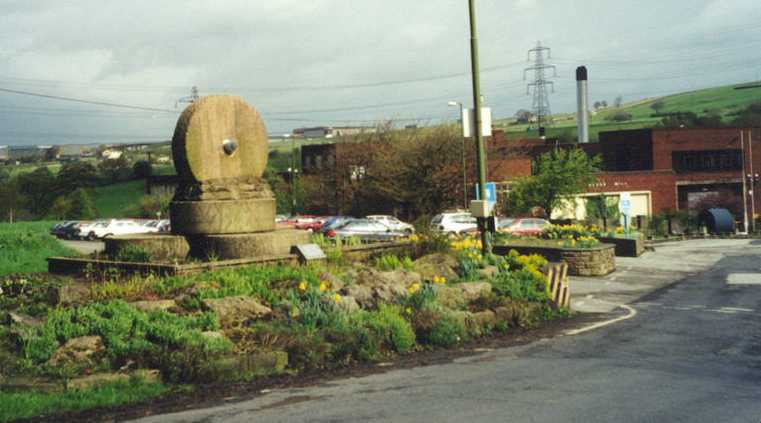 This picture shows the Grimshaw Brook Mill with a former paper-making cylinder in front. Photo taken westward, in March 1999. Figure 3. The “Kollergang Stone”, which is located at the entrance to the site. Note Grimshaw Brook Mill and paper-making cylinder of upper photo on the right side of this photo. This photo can also be compared with the picture of the Grimshaw site taken from Belthorn – the smokestack and the Kollergang stone can be seen in both photos if you look carefully. Photo taken westward, in March 1999. The paper mill extends across the brook (it’s actually built over the stream). As noted in Figure 1, the envelope factory is just downstream of the paper mill and is on the west bank of the brook. 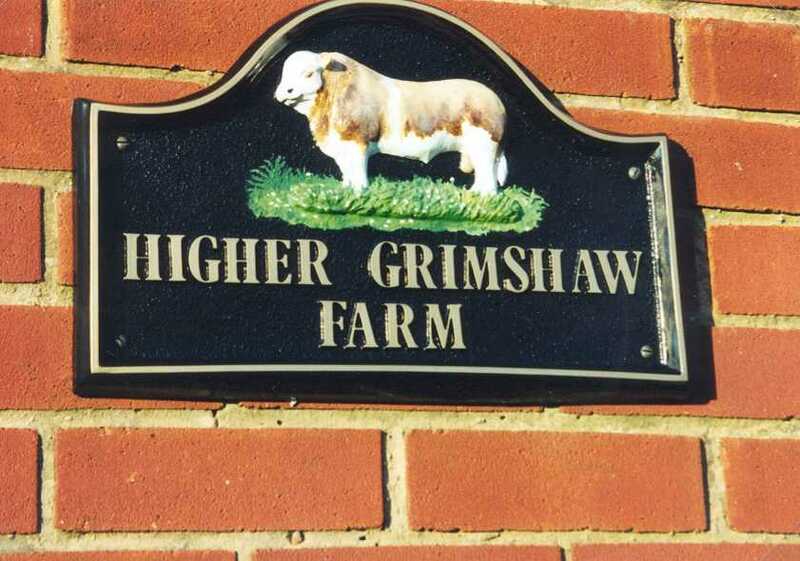 “Higher Grimshaw Farm” is located above (southwest of) Grimshaw Brook, near the road that leads into the envelope factory. 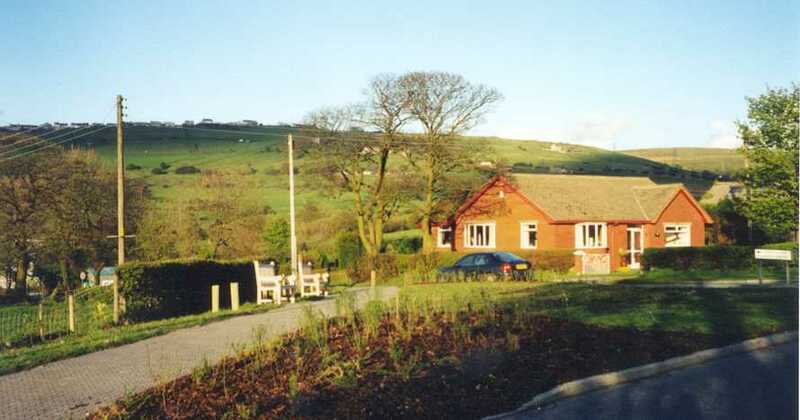 A view of Higher Grimshaw Farm, from the front side near the road, is shown in Figure 4. A close-up of the plaque near the door of the farmhouse is shown in Figure 5. Figure 4. Northeast view of front side of Higher Grimshaw Farm. The village of Belthorn is visible on the horizon, at the top of Yate & Pickup Bank. (The photo in Figure 1 was taken from Belthorn.) Photo taken April 1999. Figure 5. Plaque near the door of the farmhouse shown in Figure 4. Photo taken April 1999. An excellent color aerial photo of the factory at Grimshaw is shown in Figure 6. Belthorn, where the photo in Figure 1 was taken from, is on the far right (east) side of the photo. Figure 6. Aerial photo of Grimshaw location obtained from the Old Maps website (www.old-maps.co.uk). Grimshaw Brook can be seen running through the factory and emerging on the west side, where it meanders to a bridge. 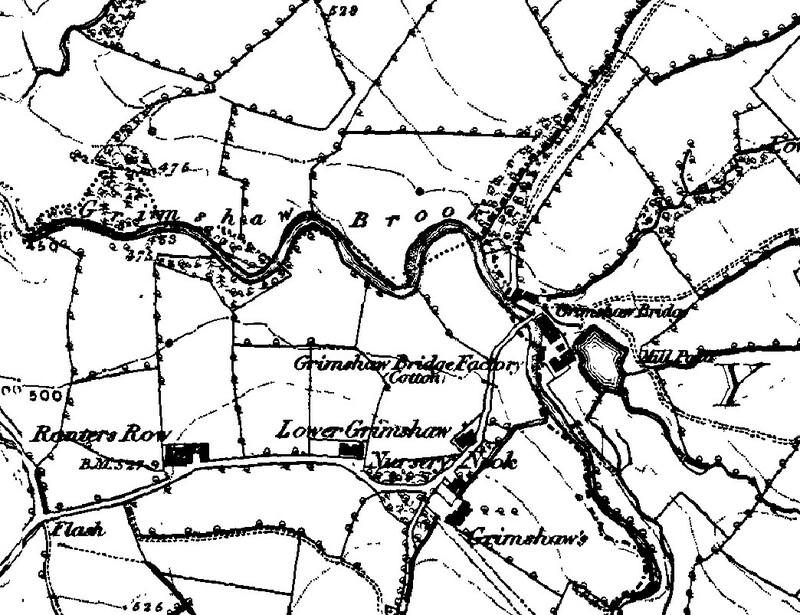 The area around Grimshaw as it existed over 150 years ago (about 1846) is shown on an Ordnance Survey map which is presented on a companion webpage. The Old Maps website (www.old-maps.co.uk) has available maps from 1849 for the area. A snippet for the Grimshaw location is shown in Figure 7. Figure 7. 1849 Ordnance Survey map of the Grimshaw location and surrounding area. Note the significant features, including Grimshaw Brook, Grimshaw Bridge and Grimshaw Bridge Factory, Lower Grimshaw and “Grimshaw’s”. The Mill Pond to the southeast of the Grimshaw Bridge factory can still be clearly seen in the air photo in Figure 6. Website posted August 2000, revised January 2003. Revised and reorganized in June 2004 with addition of air photo and 1849 map image.